Prepare dry rice noodles according to package directions, omitting salt. Drain; set aside. Sprinkle steak with salt and pepper. Spray 12-inch skillet with cooking spray. Heat over high heat. Add steak and cook about 3 minutes on each side or until steak is browned and still pink in center. Remove from skillet and let stand 5 minutes. Whisk together peanut oil, chili sauce, honey, lime juice, rice vinegar, soy sauce, sesame oil, fish sauce, cilantro and ginger in large bowl until well blended. Add green onions, carrots, bell pepper, cucumber and cooked rice noodles to oil mixture; set aside. Slice steak across the grain into thin strips. Add to bowl. Toss to coat evenly with dressing. Divide evenly on serving plates and sprinkle with prepared rice noodles. Refrigerate leftovers. 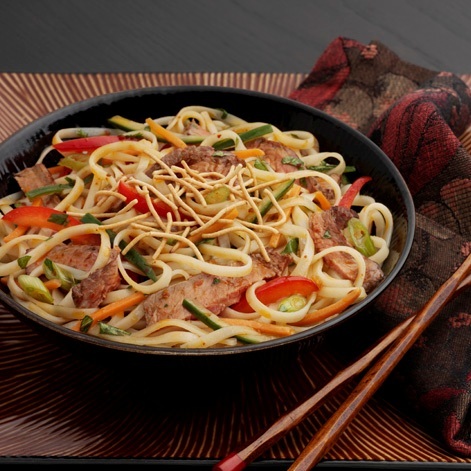 For restaurant-style presentation, place noodles on serving plates. Toss veggies with dressing and place over noodles. Add beef, then sprinkle with prepared rice noodles. Serve with extra dressing. To julienne vegetables, cut into thin, match-like sticks, about 2 inches long. Use a chef's knife or a mandoline.